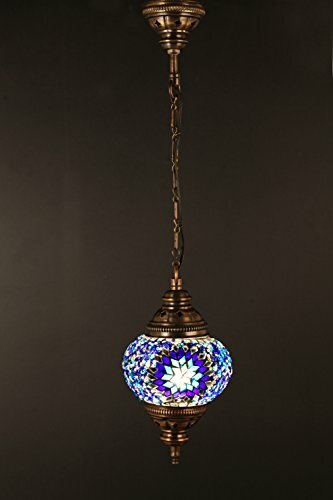 (Height: 7.9 in) Mosaic Chandelier Set 1 Single Globe, Handmade Authentic Tiffany Lighting Moroccan Lamp Glass Stunning Bedside Night Lights Brass&Glass Ottoman Turkish Style by LamodaHome at My Natures Treasures. Hurry! Limited time offer. Offer valid only while supplies last. 100% handmade original colored glass and never change color. This product is compatible with types E12 (US/CAN) bulbs. Antique Brass Color Metal Body. On/Off Switch. US Compatible.120 V plugs. UL/CE certified electric cables. If you have any questions about this product by LamodaHome, contact us by completing and submitting the form below. If you are looking for a specif part number, please include it with your message.